I am obsessed with my bathroom floor. It is so pretty. Drawing inspiration from artisan cement tiles, the SomerTile Art Black 9-3/4 in. x 9-3/4 in. Porcelain Floor and Wall Tile is a gorgeous tribute to encaustic design. This porcelain tile features a large floral old-world pattern in snowy white that frames dueling arcs in the center, offering subtle contrast and dimension to the decoration. Set on a black glaze, the contrasting design features a weathered, speckled look, replicating the beauty of its cement muse. The floral, geometric pattern blends into virtually any design theme, making this an exceptional product for modern installations and historic renovations. Offering a high durability rating and dense porcelain body, this tile is an excellent choice for most interior and exterior installations, including showers, kitchens and backsplashes. Such BEAUTIFUL tile!!! I purchased this for a small terrace that is located out of my kitchen. The tile is perfect for this area. This tile is frost-resistant; therefore , it works for an outside area and the design works perfectly with the wrought iron fence that will be surrounding this little nook. I'm so pleased. 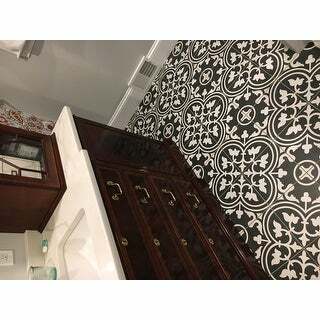 These tiles are beautiful, we revived 70 sq ft worth and only one tile broke during shipping. I put them in our entryway though I am not sure they are rated for that. this tile is porcelain and looks exactly like the cement encaustic type only it is much easier to lay, maintain and has better durability. I get compliments on my floor all the time! 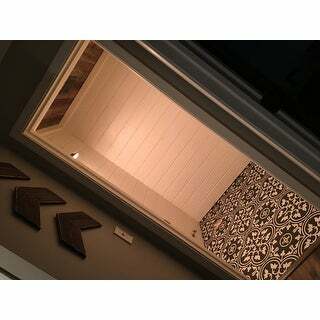 Did our entire "chick" den in this amazing tile. It's a showstopper. I get compliments on it all the time. I was a little worried ordering tiles but did my research and this was the best price, and I love O customer service. The delivery was perfect. They placed the pallet right into my garage for me. About 5% of the tiles were slightly damaged, but we were able to use them on edges, and I consider that normal on a pallet of tiles. Otherwise the finish on them was consistent, they were easy to lay. We spaced them closer together to get the proper effect of the repeating tile. In doing so, we chose a black sandless grout for such a small seam (so worth it but an absolute BEAR to wipe up black grout!) Make sure to consider spacing and grout color choices with this kind of repeating pattern; white grout tends to break up the visual effect of the pattern repeat. Highly recommend and will be using them in my bathroom remodel if my husband will let me get away with it! This tile is Beautiful, pictures do not do it justice. I did a lot of research using porcelain verses ceramic, went with porcelain for its durability. Overstock has a great selection at a affordable price!! I love, love, love this tile! I bought it to replace my kitchen laminate floor and it could not have turned out better. Only 3 tiles out of the 11 boxes I purchased were broken. That turned out to not be a problem as they were put to good use as cut pieces. This floor will give your space the wow factor if that's what you are looking for. It even feels amazing under foot. Very silky and luxurious. 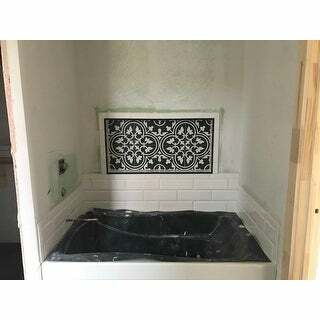 I have gotten so many complements and would recommend this tile for any home upgrade project. It does take a long time to deliver (2+ months for me so plan accordingly). LOVE this tile. I renovated my children's bathroom and I couldn't be more pleased. The tile itself is a high quality, thick tile and looks beautiful when it is laid down. It was packed very tightly so that it came unbroken. Highly recommend it. I’m so glad I chose these. I went more plain and simple with the colors and textures elsewhere in this tiny half bath so I could add a pop with these. None came broken in the 4 boxes I ordered (some kind of Miracle) and they look beautiful! My husband even says he loves the tile... WHAT! Very happy with this purchase. The tile is well made and absolutely stunning!! It really adds a lot of style to my bathroom. I love it! 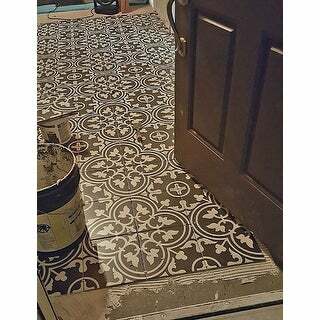 We re-tiled our entryway and mudroom with this this tile. I cannot be happier. I'm back to buy more for our kitchen. This tile is amazingly high quality. My tile guy was impressed. It went down easily and is easy to maintain and clean. It's got an amazing look and feel. 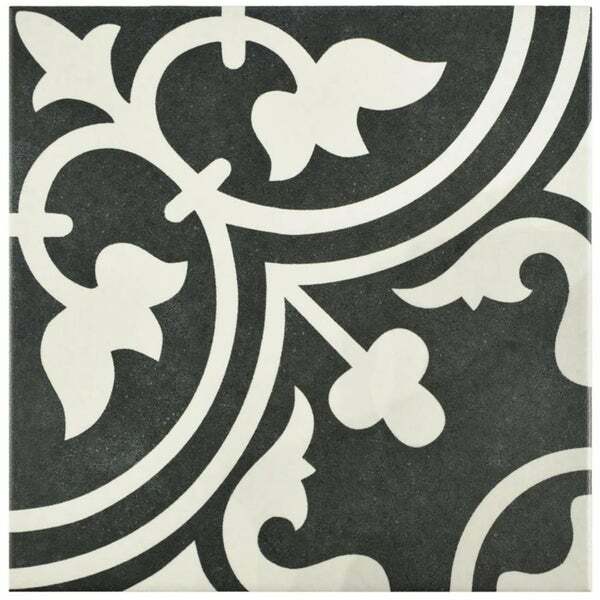 I have purchased this tile 4 times from Overstock. Overstock customer service is amazing. First off the rating on this tile shouldn't be so low, BC of someone lowering their review BC of shipping. Shipping has nothing to do with the product itself. This tile just got installed in my half bath and its amazing. Its bold, beautiful and definitely makes a statement.nothing but compliments. You won't be disappointed, and if you have to wait a while to get it (which I didn't) its worth the wait. One came damaged with glue on it, why would you even send it that way? I am in love with this tile! We used this in our half bath and laundry room and it turned out perfect. Classy and fun! Bought this tile to use in my new home. They are gorgeous and it turned out beautifully. Very happy with the quality. I have done two bathrooms and kitchen accent walls in this tile. Very easy to work with and looks great. Better value than my local home store. I didn't receive one broken box or tile. These tiles are beautiful. I love the design and the color. I love the matte finish and they look great in my mud room and are exactly what I was looking for. 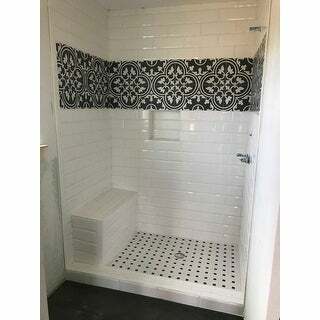 Beautiful tile used in a bathroom renovation. Would purchase again. This tile is so beautiful and timeless. It came well packaged with no broken tiles. It looks great in our small bathroom and laundry room. I really couldn’t be happier with the cost and quality! 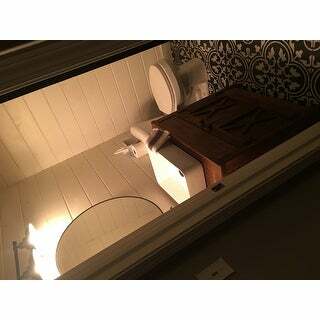 "We need to cover approximately 80 sq ft. The only 2 options are “Sample” and “10x10” - is the “10x10” option a case or how do I know what I need to order to fulfill my quantity needed?" You need the 10x10. That’s the size of the tile. There are 16 in a box. We did a small laundry room (5.25x5.5 feet) and needed 2 boxes. You will probably need 8 boxes. It is very beautiful. "Can you please tell me if the white in this tile is a stark white, or, is it a soft white with subtle ivory tones? " The white portion of this tile is a cool white. "How many cases would I need to cover 158.25 SF." Since each case of 16 tiles covers 10.76 square feet, you will need at least 15 cases to cover 158.25 square feet. We also always recommend purchasing at least 10-percent (closer to 20-percent for patterned tiles) more than you need in case of cuts and breaks. "Can you tell me what level of slip resistance these tiles have? I plan to use them outside on a front porch step. Thanks." The tile really does not have any "tooth" to the surface but is not as slick as a polished tile. "Is the price per tile or each box?" You can either choose a case of tiles or a sample tile. Please use the options menu to make your selection. "Can and should the tiles be sealed after installation?" "I need to cover 320 square feet how much of this tile do I need?" Since each case of 16 tiles covers 10.76 square feet, you will need at least 30 cases to cover 320 square feet. We also always recommend purchasing at least 10-percent (closer to 20-percent for patterned tiles) more than you need in case of cuts and breaks.